What Are the Risk Factors for Barbiturate Abuse? What Are the Signs and Symptoms of Barbiturate Abuse? How Do Medical Professionals Diagnose Barbiturate Abuse? Is It Possible to Treat Barbiturate Abuse at Home? What Is the Treatment for Barbiturate Abuse? What Is the Prognosis of Barbiturate Abuse? Barbiturates are a group of drugs in the class of drugs known as sedative-hypnotics, which generally describes their sleep-inducing and anxiety-decreasing effects. While barbiturate abuse may not be as talked about as some other drugs, statistics show that it is a significant health risk.There is just a small difference between the dose that causes desired sedation and that which causes coma and death. Addiction can result from using high doses of this group of medications for as little as one month, and withdrawal symptoms may be life threatening. Barbiturates were first used in medicine in the early 1900s and became popular in the 1960s and 1970s as treatment for anxiety, insomnia, or seizure disorders. With the popularity of barbiturates in the medical population, barbiturates as drugs of abuse evolved as well. Barbiturates were abused to reduce anxiety, decrease inhibitions, and treat unwanted effects of illicit drugs. Barbiturates can be extremely dangerous because the correct dose is difficult to predict. Even a slight overdose can cause coma or death. Barbiturates are also addictive and can cause a life-threatening withdrawal syndrome. Barbiturate use and abuse has declined dramatically since the 1970s, mainly because a safer group of sedative-hypnotics called benzodiazepines are being prescribed. Benzodiazepine use has largely replaced barbiturates in the medical profession, with the exception of a few specific indications. Doctors are prescribing barbiturates less, and the illegal use of barbiturates has also substantially declined, although barbiturate abuse among teenagers may be on the rise compared with the early 1990s. Addiction to barbiturates, however, is uncommon today. There are many different barbiturates. The primary difference among them is how long their effects last. The effects of some of the long-acting drugs may last up to two days. Others are very short acting. Their effects last only a few minutes. Although the medical use of barbiturates has declined since the 1970s, and street abuse was also in decline, high school surveys suggest abuse has been rising over last 10 years. A common reason to abuse barbiturates is to counteract the symptoms of other drugs. The increase in the abuse of barbiturates may be due to the popularity of stimulating drugs such as cocaine and methamphetamines. The barbiturates ("downers") counteract the excitement and alertness obtained from the stimulating drugs. Today's drug abusers may be too young to remember the death and dangerous effects barbiturates caused in the 1970s, so they underestimate the risks of using them. Barbiturates are also commonly used in suicide attempts. 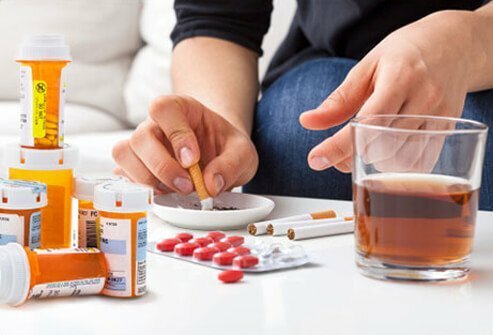 Other risk factors for the use of barbiturates includes other addictions, like to gambling, tobacco, alcohol, or other drugs. In general, barbiturates can be thought of as so-called brain relaxers. Alcohol is also a brain relaxer. The effects of barbiturates and alcohol are very similar. Pain medicines, sleeping pills, and antihistamines also cause signs and symptoms similar to those of barbiturates. People who abuse barbiturates use them to obtain a "high," which is described as being similar to alcohol intoxication, or to counteract the effects of stimulant drugs. At even higher doses, complications can include the person being unable to be aroused (coma) and possibly stop breathing. Death is possible. One of the dangers of abusing barbiturates is that the difference between the dose causing drowsiness and one causing death may be small. In the medical profession, this difference is called a narrow therapeutic-to-toxic range. This is the reason why barbiturates are dangerous. It is also why barbiturates are not often prescribed today. In addition to having a narrow therapeutic range, barbiturates are also addictive. If taken daily for longer than about one month, the brain develops a dependence on the barbiturate, which causes severe symptoms if the drug is withheld. Symptoms of withdrawal or abstinence include tremors, difficulty sleeping, and agitation. These symptoms can become worse, resulting in life-threatening symptoms, including hallucinations, high temperature, and seizures. Pregnant women taking barbiturates can cause their baby to become addicted, and the newborn may have withdrawal symptoms. The doctor cannot give appropriate treatment for barbiturate abuse over the telephone. Observation at a hospital emergency department is necessary. If you believe someone has taken barbiturates inappropriately, take him or her to a hospital emergency department for evaluation by a doctor. Soon after taking barbiturates, a person may only be drowsy or seem intoxicated, but more serious symptoms can develop quickly and unpredictably. If the person is drowsy or you are unable to arouse the person (if he or she seems to be in a coma), call 911 for emergency medical transport and immediate treatment in the ambulance. Bring any leftover pills, pill bottles, or other medicines the person may have taken to the hospital with you. A urine test can readily identify barbiturate use. Diagnosis in a hospital emergency department, however, concentrates on diagnosing other potential reasons for the person to be drowsy or display symptoms characteristic of barbiturate abuse, such as other drugs taken, head injury, stroke, infection, or shock. These diagnostic efforts take place while the person is being treated. In general, the person will have an IV started and blood will be drawn. An ECG (electrocardiogram) will be performed to evaluate the person's heart. Other diagnostic efforts depend on the specific situation. There is no home treatment for barbiturate abuse. If you believe someone has taken barbiturates inappropriately, take him or her to the hospital for evaluation by a doctor immediately. Barbiturates have a narrow therapeutic index and can cause coma or death if taken inappropriately. This is especially true in children and in elderly people. Because children are smaller and weigh less than adults, even small doses of barbiturates could be life threatening. Elderly people can be more sensitive to barbiturates and develop a coma with small doses. The treatment of barbiturate abuse or overdose is generally supportive. The amount of support required depends on the person's symptoms. If the person is drowsy but awake and can swallow and breathe without difficulty, the treatment may consist of just watching the person closely. If the person is not breathing, a breathing machine is used to ensure the person can breathe well until the drugs have worn off. Most people receive a liquid form of activated charcoal to bind to any drugs in their stomach. This may be done by placing a tube into the stomach (through the nose or mouth) or by having the person drink it. Most people are admitted to the hospital or are observed in the emergency department for a number of hours. Other treatments depend on the specific situation. Although rare, anyone who is addicted to barbiturates requires prolonged therapy to avoid the dangerous symptoms of withdrawal. Addicted individuals are treated with decreasing doses of barbiturates (called detoxification) until they are drug free. Relapse prevention has been found to be most effective when it involves several individuals from various parts of the addicted individual's life. That might include the person's primary care doctor, substance abuse and mental health counselors, physician addiction specialists, as well as family, friends, clergy, and law enforcement professionals. With aggressive treatment in the hospital, most people survive. But even with intensive therapy, some who overdose will die. A person's outcome, also called prognosis, after abusing barbiturates depends on a number of factors. Coupey, S.M. "Barbiturates." Pediatric Review 18.8 Aug. 1997: 260-264. Kedia, S., M.A. Sell, and G. Relyea. "Mono-versus polydrug abuse patterns among publicly funded clients." Substance Abuse Treatment, Prevention and Policy 2 (2007): 33. Kulig, J.W., The Committee on Substance Abuse. "Tobacco, alcohol and other drugs: The role of the pediatrician in prevention, identification and management of substance abuse." Pediatrics 115.3 Mar. 2005: 816-821. Miller, N.S., and M.S. Gold. "Management of withdrawal syndromes and relapse prevention in drug and alcohol dependence." American Family Physician 1:58.1 July 1998: 139-146.